About two and a half years ago, I wrote an advance review of Seanan McGuire’s Ashes of Honor for CC2Konline.com, a website dealing in all things pop culture. McGuire is one of my favorite urban fantasy authors, and I had the privilege of being able to interview her as well. 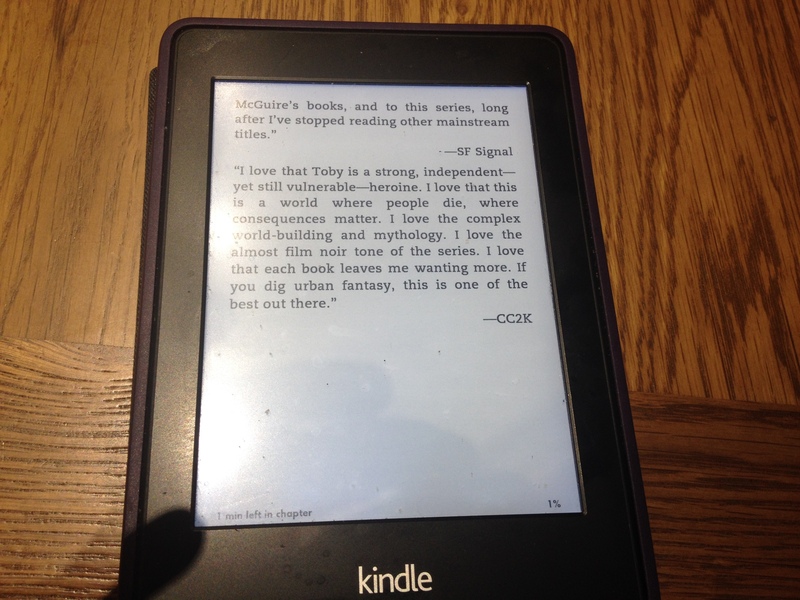 It’s a little hard to see, but that’s my Kindle, opened up to the promotional quotes section of The Winter Long. And that last quote…I wrote that! Even if I hadn’t seen CC2K, I’d recognize my wholly unnecessary use of em-dashes anywhere! I love this series. I love that Toby is a strong, independent—yet still vulnerable—heroine. I love that this is a world where people die, where consequences matter. I love the complex world-building and mythology. I love the almost film noir tone of the series. I love that each book leaves me wanting more. If you dig urban fantasy, this is one of the best out there. If you’re looking to try the genre for the first time, this series could be the place to start. And even now, that pretty much sums up my feelings about the October Daye series in a nutshell. 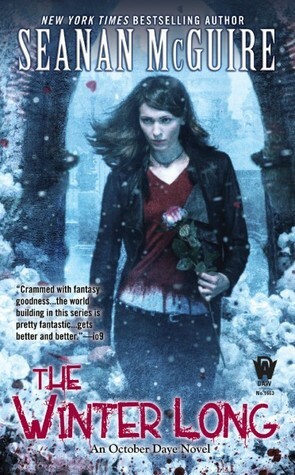 Seanan McGuire is one of the best urban fantasy writers out there. I have never picked up a book of hers and been disappointed. I don’t know whether McGuire herself chose the quote, or someone from the DAW promotional team. Either way, I am completely flattered (even if I am six months late in noticing). If you’re interested in the series, do yourself a favor and start with Rosemary and Rue, the first book. The plot and worldbuilding are too complex to jump in the middle, and you’ll find that McGuire, as a writer, plays the long game: the books pay off more the longer you stick with them. It’s worth it, too, because they just keep getting better and better.